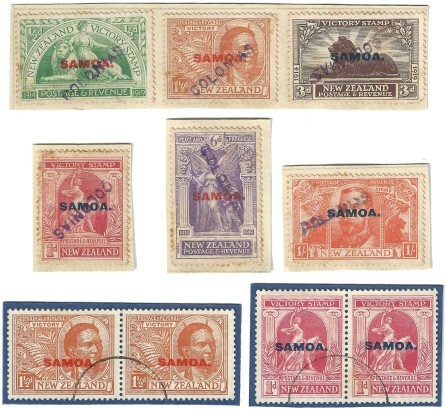 1939 25th Anniversary set of 4. 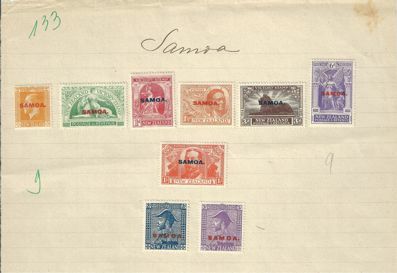 SG 195-198. 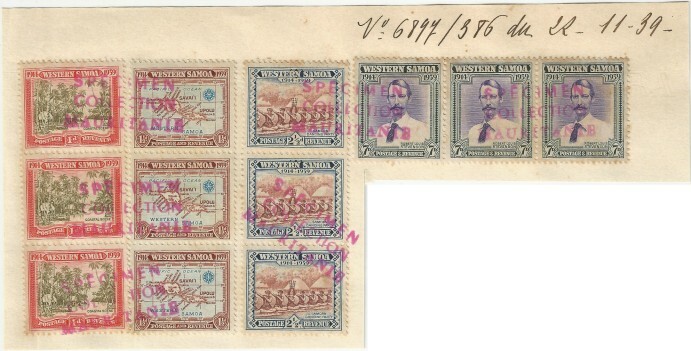 Each in a strip of three affixed to piece of archive sheet and cancelled 3-line SPÉCIMEN / COLLECTION / MAURITANIE - UNIQUE items from the Mauritania Post Office UPU specimen collection. 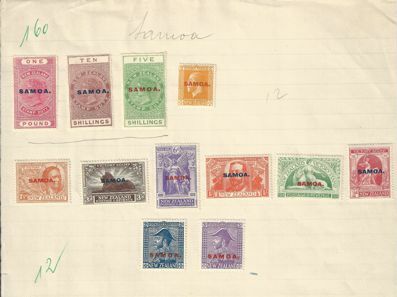 Album page, headed 'Samoa' and numbered '195' in green, from Tunisia Post Office archive, bearing 12 stamps - 1914-24 Perf 14 5s, 10s, £1 (SG124-126), 1916-19 2d (SG137), 1920 Victory set - ½d to 1s (SG143-148) and 1926 'Admiral' 2s & 3s on 'Jones' paper (SG167-168) - each handstamped SPECIMEN in semi-bold sans-serif caps (12.8×2.6mm) - applied by the Tunisian Receiving Authority, with manuscript annotation '12' in left margin. BPA cert (2015). 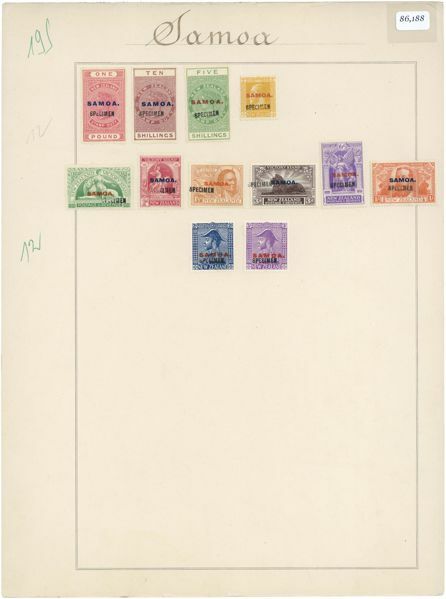 Album page, headed 'Samoa (Nouvelle Zélande G.B)', from Tunisia Post Office archive, bearing 17 stamps - 1935 Silver Jubilee set 1d to 6d (SG177-179), 1935 Pictorial set ½d to 3s (SG180-188) - each handstamped SPECIMEN in semi-bold sans-serif caps (12.8×2.6mm) - applied by the Tunisian Receiving Authority, with issued 1939 'N.Z. 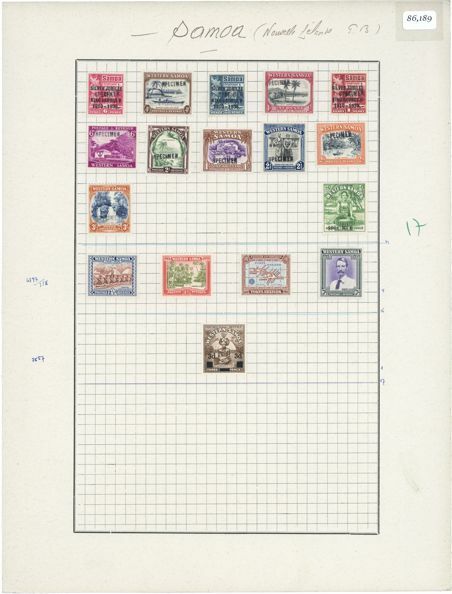 Control' set 1d to 7d and 1940 3d on 1½d (SG195-199), with manuscript annotation '17' in right margin. BPA cert (2015). 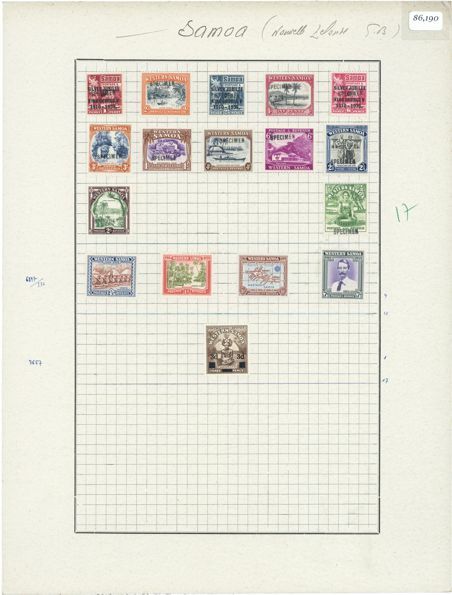 Album page, headed 'Samoa (Nouvelle Zelande G.B)', from Tunisia Post Office archive, bearing 17 stamps - 1935 Silver Jubilee set 1d to 6d (SG177-179), 1935 Pictorial set ½d to 3s (SG180-188) - each handstamped SPECIMEN in semi-bold sans-serif caps (12.8×2.6mm) - applied by the Tunisian Receiving Authority, with issued 1939 'N.Z. 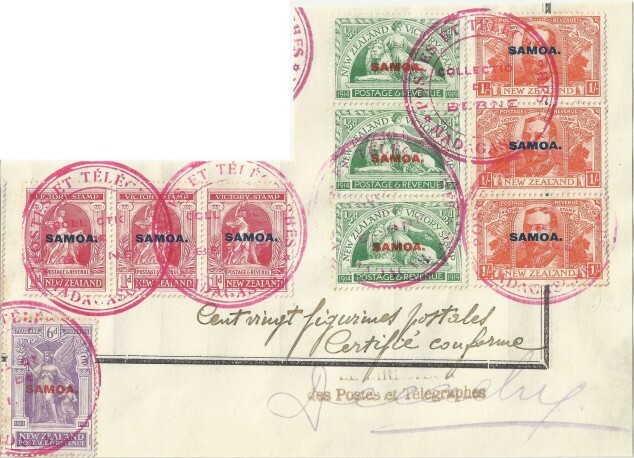 Control' set 1d to 7d and 1940 3d on 1½d (SG195-199), with manuscript annotation '17' in right margin. BPA cert (2015).